While in Bangkok, don't miss out on Safari World and Let's Relax Spa Treatments! Very easy to pickup. The kiosk employees were very helpful and friendly. Easy to use and reliable on my trip from Bangkok to Chaiang Mai to Krabi. It's never been so easy to stay connected whilst abroad. With an easy pick up and drop off service at Suvarnabhumi Airport or Don Muang International Airport, you'll enjoy fast 4G WiFi access throughout your stay in Thailand, without the stress of sourcing WiFi once you get there. 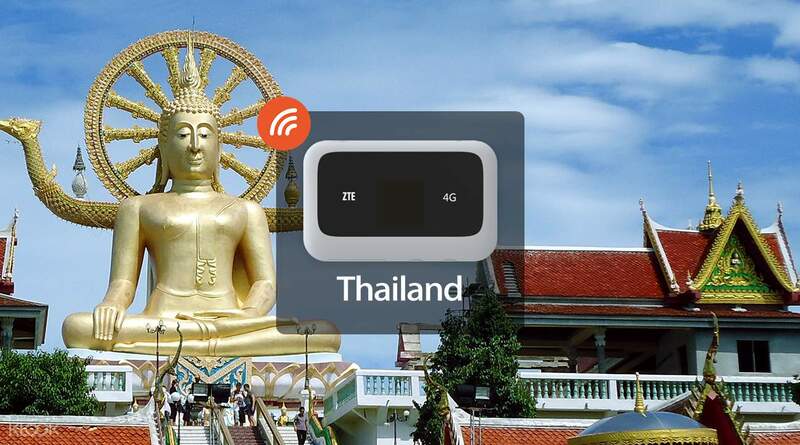 The speedy 4G pocket WiFi in Thailand connects up to 10 different phones, laptops and tablets at once and supports 8-10 hours of surfing on one battery charge. With an included power bank, you won't have to worry about dulling your travels due to low charge! So add some spontaneity to your travels with the ability to plan on the go and keep in touch with friends and family wherever you are. Avail of the pocket WiFi rental in Thailand from Klook today! Super happy that I decided to book this 4G Wifi on our travel to Bangkok. It's best to be connected on the internet to help us find our way to all the nice place near were staying. It's a complete package with Wifi, powerbank and cord. This is really a must for travellers. Super happy that I decided to book this 4G Wifi on our travel to Bangkok. It's best to be connected on the internet to help us find our way to all the nice place near were staying. It's a complete package with Wifi, powerbank and cord. This is really a must for travellers. Internet is not as fast but still reliable. When claiming the device, after the immigration, go down 2 floors and smile kiosk is very near the train station. Also make sure you have THB 2,000 for the deposit. Internet is not as fast but still reliable. When claiming the device, after the immigration, go down 2 floors and smile kiosk is very near the train station. Also make sure you have THB 2,000 for the deposit. Fast and reliable internet. It also comes with a powerbank. Pick-up and drop-off location is easy to spot as well. Just use the elevator to B1 level and look for the “SMILE” booth. Will definitely book again on my next visit. Fast and reliable internet. It also comes with a powerbank. Pick-up and drop-off location is easy to spot as well. Just use the elevator to B1 level and look for the “SMILE” booth. Will definitely book again on my next visit. It was quick and easy to locate the counter where you should claim the device. The personner are very friendly too. Note that the counter will require a 2000thb deposit upon claiming. You can get it back upon returning the pocket wifi. This is definitely a must when you travel. It will help stay connected with your loved ones while away from home. You can use it to book grab rides. Search for locations and other thing on the internet whenever necessary. Cheaper than other options. It comes with a 4000mah powerbank that you can also use to extend your phone's battery life. Highly recommended! It was quick and easy to locate the counter where you should claim the device. The personner are very friendly too. Note that the counter will require a 2000thb deposit upon claiming. You can get it back upon returning the pocket wifi. This is definitely a must when you travel. It will help stay connected with your loved ones while away from home. You can use it to book grab rides. Search for locations and other thing on the internet whenever necessary. Cheaper than other options. It comes with a 4000mah powerbank that you can also use to extend your phone's battery life. Highly recommended! Group travellers from Cebu to BKK, Thailand. Easy booking and easy to find the smile pocket wi fi rental shop, B1 of Suvarnabhumi airport. The connection was very fast, complete set and the battery is okay, it took us almost 8rs before using the powerbank. Group travellers from Cebu to BKK, Thailand. Easy booking and easy to find the smile pocket wi fi rental shop, B1 of Suvarnabhumi airport. The connection was very fast, complete set and the battery is okay, it took us almost 8rs before using the powerbank. Very easy to order online before we went. Pickup instructions and location in the airport were very useful. The dongle connected strait away with no problems. We travelled up and down Thailand over three weeks and hopped across to some of the lovely islands. Everywhere we went the dongle connected to the network and we were not out of signal once. Uploading bulk photos and videos also worked every time. Very impressed and would choose this again next time. Very easy to order online before we went. Pickup instructions and location in the airport were very useful. The dongle connected strait away with no problems. We travelled up and down Thailand over three weeks and hopped across to some of the lovely islands. Everywhere we went the dongle connected to the network and we were not out of signal once. Uploading bulk photos and videos also worked every time. Very impressed and would choose this again next time. Quick and easy to claim and use. Didn’t have a hard time connecting and the signal is great with no interruptions. Quick and easy to claim and use. Didn’t have a hard time connecting and the signal is great with no interruptions. The wifi connection is reliable and able to use it on my navigation all throughout bangkok stay. A must have. Will book again. The wifi connection is reliable and able to use it on my navigation all throughout bangkok stay. A must have. Will book again. Super loved the pocket wifi and it’s really worth it! Will definitely book this again when I come back to Bangkok! Super loved the pocket wifi and it’s really worth it! Will definitely book this again when I come back to Bangkok!